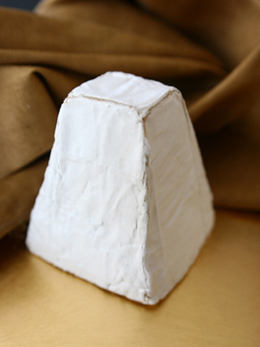 A goat cheese pyramid from California’s Cypress Grove Chevre reflects Americans’ growing interest in cheeses that “tell a story.” Read our review of this wonderful artisan cheesemaker. 1. Natural & Artisan Cheeses: Americans are getting better taste in cheese. Between 2001 and 2006, sales of natural cheese increased 10%, while sales of processed cheese declined 9.1%, according to research firm Mintel International. Specialty cheese sales at supermarkets that gross over $2 million per year have grown 8.6%, according to The Nielsen Company. 2. Convenience: Pre-seasoned cheese, along with grated and crumbled cheese, string cheese, stick cheese, cubed cheese and natural cheese slices are growing at an annual rate of up to 17%. 3. Ethnic Cheeses: In 2006, Italian cheeses surpassed American natural cheeses in popularity (note that this popularity is highly influenced by the amount of mozzarella on pizzas). Additionally, Latin American and Spanish cheeses are no longer considered a niche market, since many non-Hispanic consumers incorporate the cheeses into their cooking. Half of the top 10 fastest-growing specialty cheeses at retail are Hispanic cheeses. 4. Probiotics: There is a large increase in cheese products with probiotics, beneficial bacteria that aid digestion that were previously found largely in yogurts. In September 2007, Kraft introduced LiveAction cheese sticks, the first probiotic cheese in North America with national distribution. For more information about probiotics, read our article, What is Probiotic Food? Overall, consumers are interested in cheese that “tells a story.” Rather than boring sliced, processed cheese from a large manufacturer, consumers have turned their attention to cheeses produced in a certain region, or even a single farmstead. Still, convenience remains a top issue, and consumers will pay more for pre-grated cheese, even though freshly-grated is more flavorful. Check out the Cheese Section in THE NIBBLE online magazine for many cheese ideas for 2008.